Fragment of limestone relief. 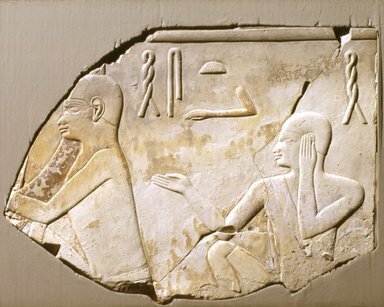 At left, in raised relief, incomplete seated man playing harp. At right, seated singer, right leg raised, right hand extended, left hand at ear. Above singer in raised relief, ‘singer’; portion of same inscription at right. Relief is fragment from a register of musicians. Condition: Poor. Very heavily saturated with salt. Slight restoration at upper right edge and on right elbow. Scattered remains of red paint on body of harper.